Room for pockets in a tulip skirt! This month I am featuring Masha from Itinerant Seamstress. Last month she made 2 Mabel skirts and shared her struggles with getting everything just right, and we all know that the biggest challenge of working with knits is the differences in stretch and recovery between cuts of fabric. I thought they both looked great, and you guys must have too, since it was the most clicked link this month. Here are Masha’s answers to the usual questions. I found her answer to the last question very reassuring, as lately I’ve had so little time to sew, and I find that even if I have a few minutes here or there, I won’t sit down and do it because I know I’ll be interrupted soon. But this month I will just sit down and get a thing or two going, even with the threat of interruption looming. It will still be some sewing, and that is what I love to do! These days, when my girls see a dress in a store or a catalog, they ask “Can you sew that for me, Mama?” Not, “Can you buy me that?” but “Can you sew it for me?” I love that. I also love deciding that I need a new skirt and having it in my hot little hands two hours later. (This is also my favorite thing about having a fabric stash). Tracing patterns and cutting fabric. I have made my peace with pressing fabric and seams – I even enjoy it now. But I still have no patience for pattern tracing and only slightly more patience for cutting fabric. I routinely rush through cutting, which results in wasted time later when my notches don’t line up. You’d think I’d have learned my lesson by now. Made or blogged in the past month only – to avoid reposts. The party is open about a month, until the last day of that month. You don’t have to blog to join in! 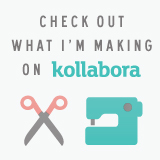 Link up your Pattern Review, your Kollabora project or even an Instagram pic. I know there are so many lovely things made that we never see because not everyone is crazy enough to blog. I also have one person who emails me the pictures so I can get them up here. If you are on a blogging platform that supports links, please link back to http://www.grayallday.com by using the Sew it Chic button in the sidebar, or just a simple mention in the text of your post. That way more people will find the party! Look around and share a comment or 2 with a neighbor. I don’t mind admitting that I savor blog comments as much as new lights in my sewing room. They are encouraging and build community.